Internet has taken learning to a new level for today’s kids. But, along with its advantage, it has its dark side also. Although we know internet is a dangerous place we can not stop our kids from using it. But, one thing which we can do for sure is to use windows child account feature. 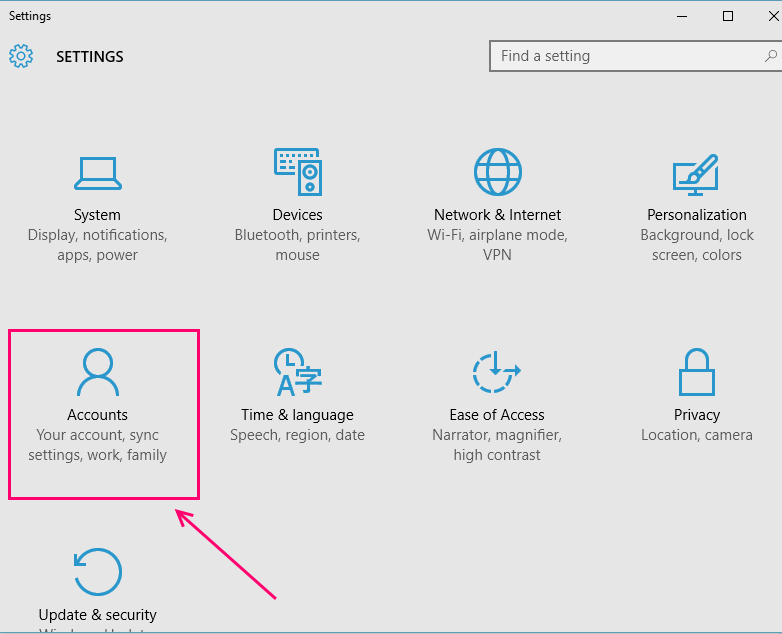 When we create a child account in windows 10, we have full control in blocking websites, monitoring their browsing activity and login timings. In a way, we can control their e-life. I know peeking into your own child’s life is not so cool, But monitoring his or her browsing pattern up to a certain age to ensure their safety is really a good idea. One of the most notable feature of windows 10 child account is weekly activity report sent to your email per week. In this weekly activity report windows 10 sends you his browsing pattern and his visited sites. 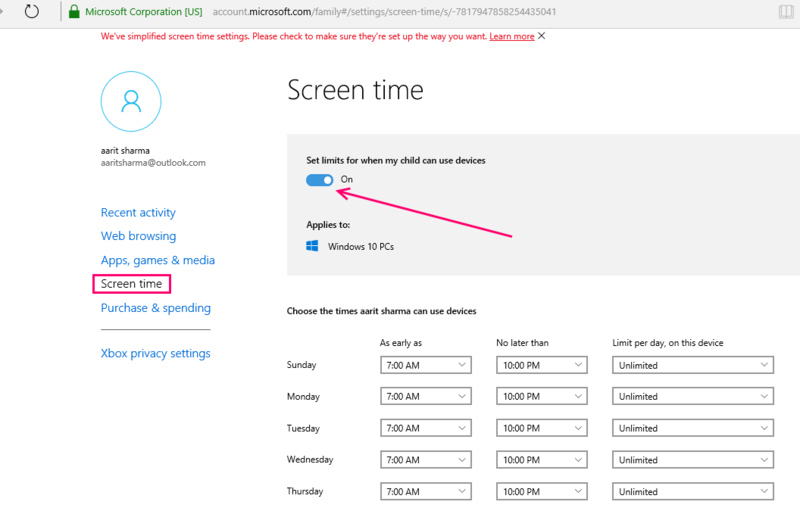 Another useful feature is to limit the login timings for the child account to ensure he does not stay overnight to use the PC affecting his health and studies. Step 1 – Click on start key and then click on settings. 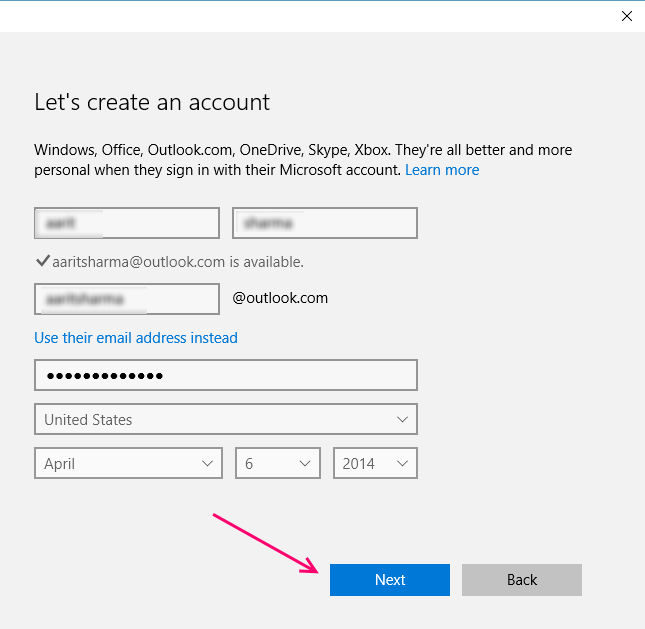 Step 2 – In the system panel which opens up, just click on accounts. 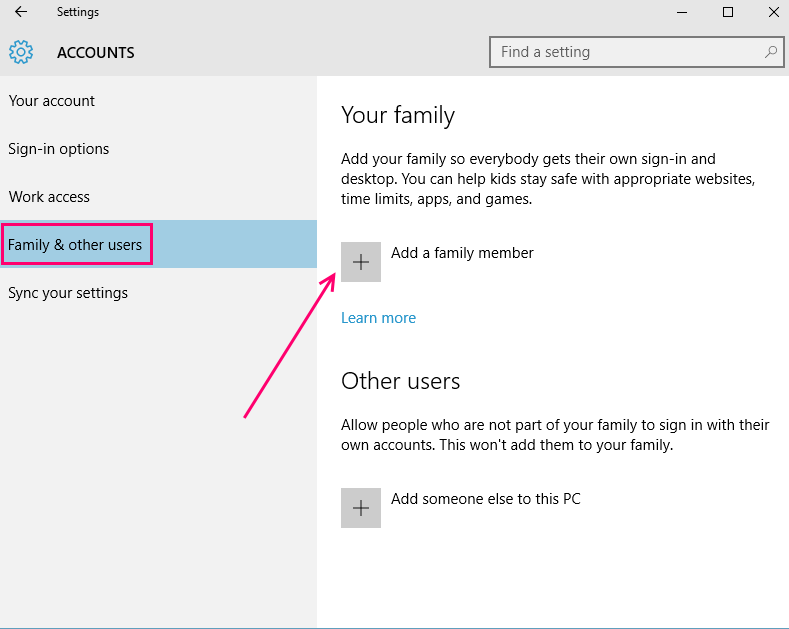 Step 3 – In left menu click on Family & Other users. Now, in the right side click on Add a family member. Step 4 – On the add account page, you have got two options. 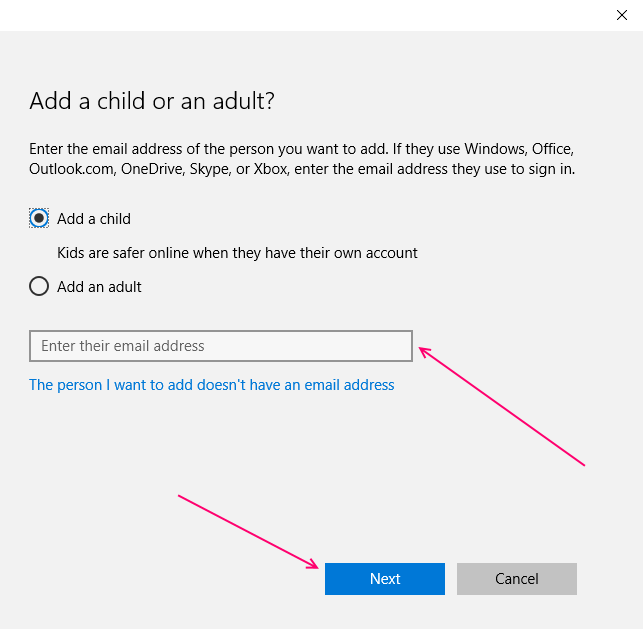 If you have already created an email address for your child, just write the email address in the field provides. 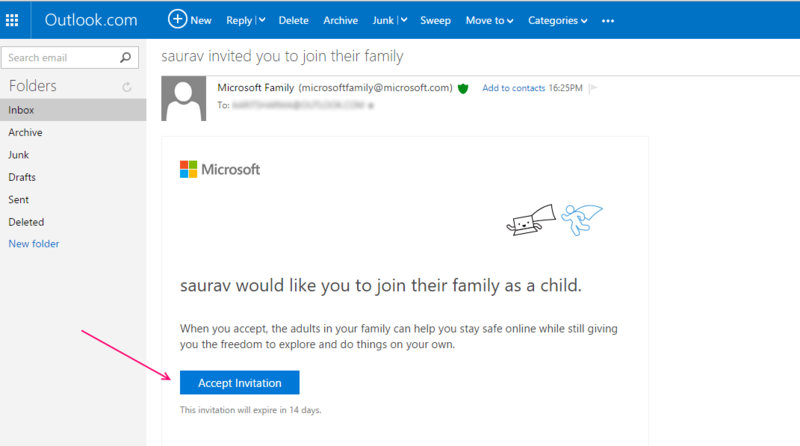 Once you write the newly created email account of your child in the field given, click next and a window saying the invitation has been sent will be displayed to you. 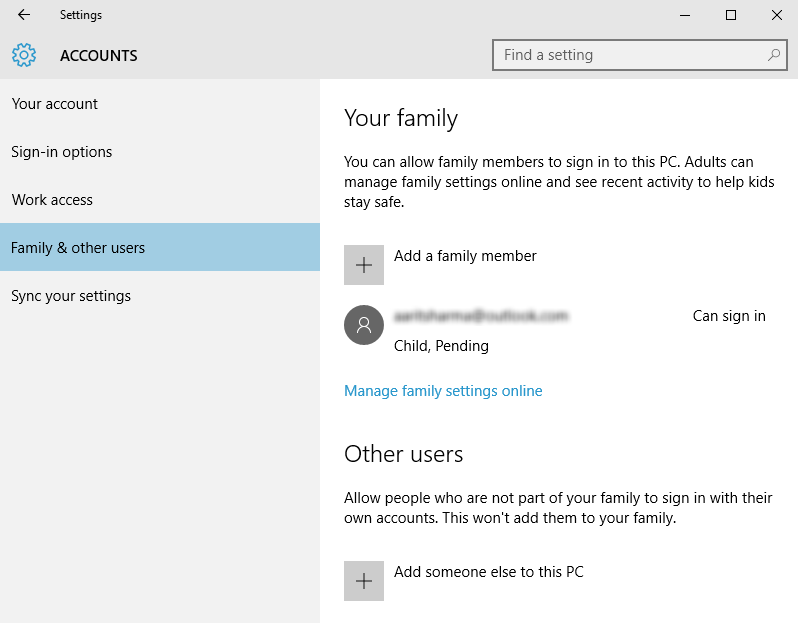 Close this window and the setting panel showing you child account pending activation will be shown. Now, login to your child email account and confirm the invitation. Click on the link below which says, ‘The person i want to add doesn’t have an email address‘. In the next screen fill all the details and one outlook.com email id of your child will be created. In next screen you need to add a phone number for the sake of protection of account from hackers. In next page two options which are checked by default are there. One of them says microsoft advertising will use his account information to enhance their online experience. Unchecking it is a better decision. 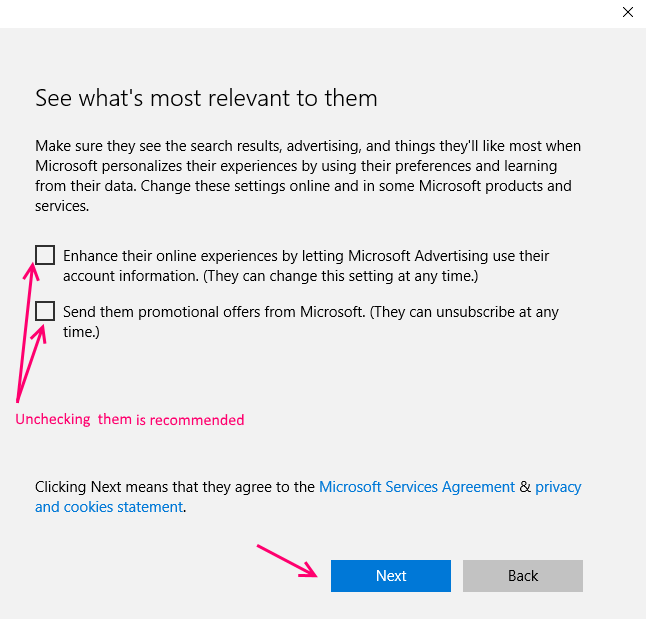 Another option says, let microsoft send them promotional offers. Better uncheck this option also. In the final step, a Good to go message is shown. Just close the box. 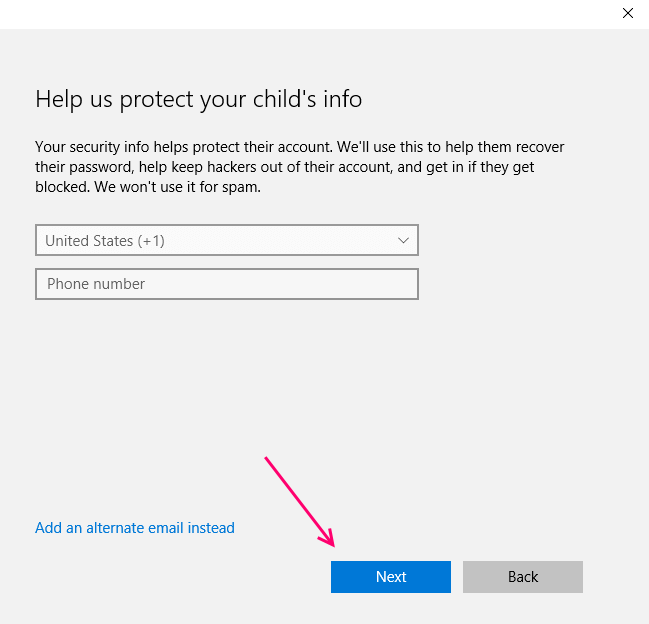 As soon as you close the box, the setting panel window showing the newly created email id of your child will be visible behind the box. Next to it the message saying can sign in will be written. 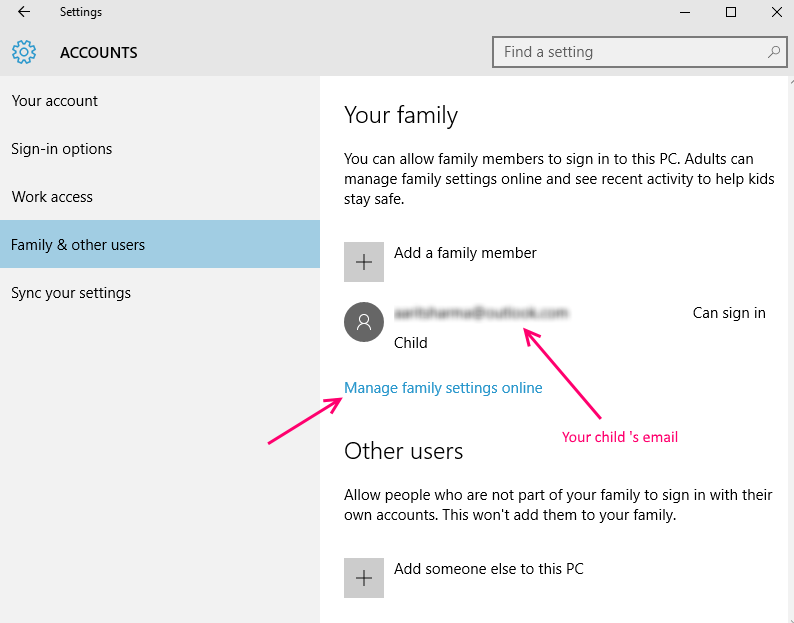 You can straight away click on Manage family settings Online link to go to family settings for your PC. 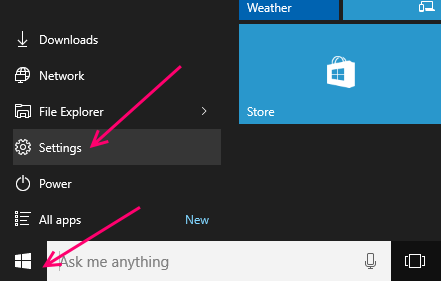 Alternatively you can also go to link: https://account.microsoft.com and click on family tab. In next page, weekly report email function is by default turned on. You can leave this enabled by default, if you want a weekly report of your child’s activity. 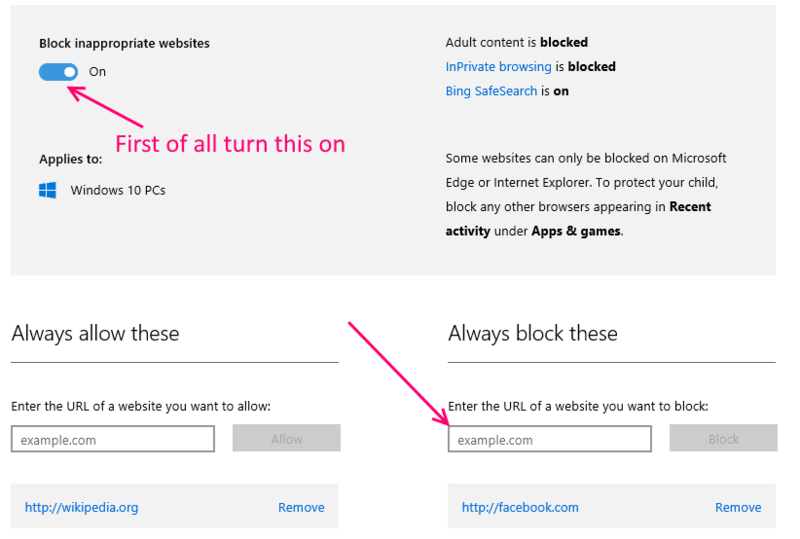 To turn on website blocking click turn on blocking next to web browsing as shown below. Now, in the next page turn on Block inappropriate websites. Once you turn this on, the input field for blocking and allowing websites will open up. Just enter websites you want to block. Now, click on screen time. Now, turn on the feature which says set limits for when my child uses the device. Now, fill the schedule and timings of use you find suitable and safe for your child. Thanks for detail article on creating child account. I will follow the instructions as it is. Good work.